Motherhood, with twins or triplets…. 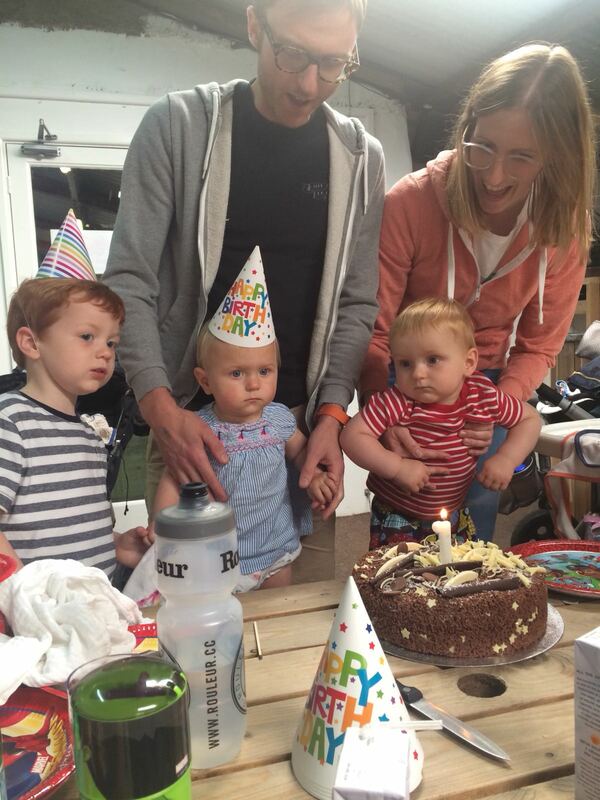 Rachel is a breast cancer research scientist and mum to twins, plus one. She lives in Manchester with fellow scientist James, and their children Sam, Jack and Meg. 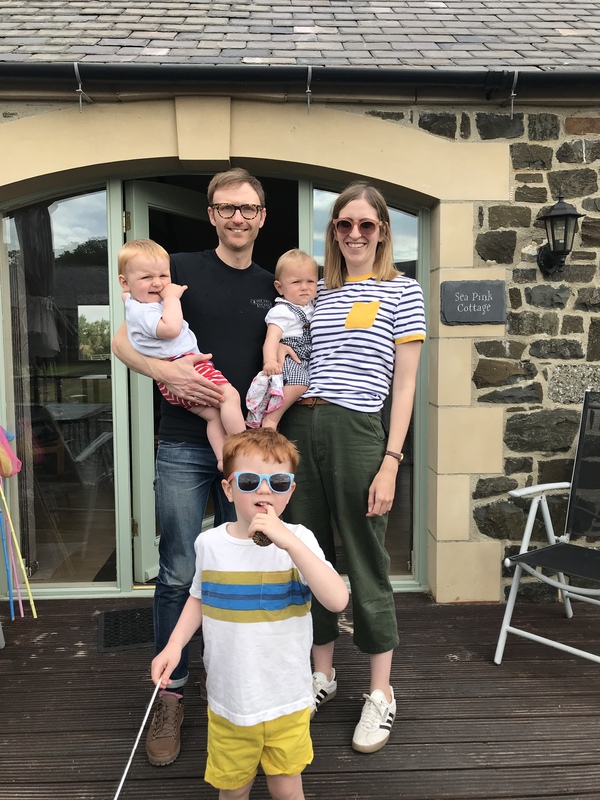 She writes about life with twins, plus one, her experiences as a working mum, the ups and down of shared maternity/paternity leave, and her work in breast cancer research on Instagram. You can also follow her husband on Insta too. 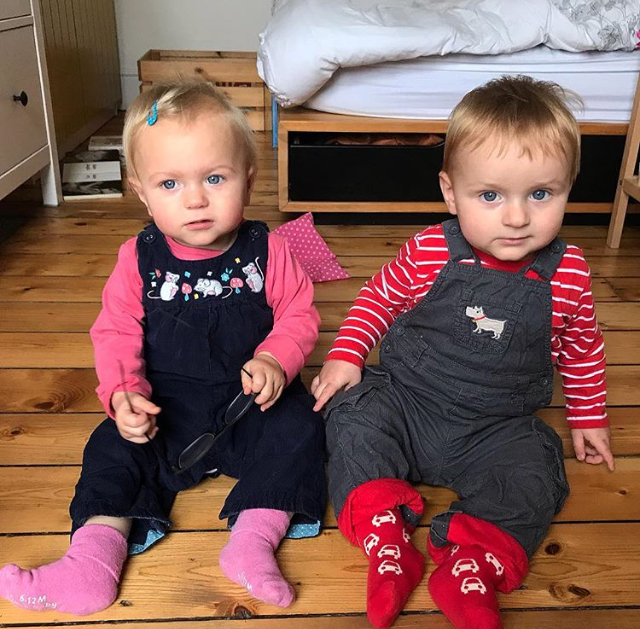 My twins are… Jack and Meg, who are 13 months old. They also have a big brother Sam, who is 4. When we discovered we were expecting twins… I was hysterical. And by ‘hysterical’ I mean full on sobbing: “Noooo, this can’t be happening” while lying on the scanning bed. It wasn’t my finest hour. Though strangely the NHS staff didn’t seem too phased, so I’m guessing they’ve seen it all before. I went home and stayed in bed and cried for a solid four days. I couldn’t see how we could have twins and continue with our lives in the way we’d planned. An extra baby just wasn’t part of the plan. The birth was… Completely different to my first one. First time round I’d wanted a perfect hypnobirth in a birthing pool, but ended up with a back-to-back baby, emergency spinal block and rotational forceps (ouch). So for the twins, I wanted to take all elements of chance out of it and booked a planned Cesarean. It was nice having a definite date to work to, but I did find the Cesarean (and the fact that I’d signed myself up to major surgery) terrifying. In the end the operation itself was OK, but I haemorrhaged afterwards and ended up needing emergency medical intervention yet again. So, I think we’ll just draw a line under me giving birth and conclude that I’m not that great at it and won’t be doing it again! I couldn’t have survived the first three months without… Gina Ford. I know Gina and her routines are controversial, but I needed to know that both babies were going to sleep at the same time, how long they’d sleep for, and that they were sleeping progressively longer at night as the weeks went on. Following Gina was a full time job but it worked a dream. It’s not for everyone, but I needed it for my sanity. Other things I couldn’t have survived without – my mum, nursery care for Sam (how anyone takes care of twins plus and older child is beyond me), and Galaxy Minstrels. I didn’t expect twins to be… Jack and Meg. I was so focused on the fact that we were having two babies and how hard it was going to be, that it almost caught me by surprise when they suddenly turned into two individual little people with such different personalities. The first year with twins was pretty rough in parts, but we wouldn’t be without either of them now. The hardest thing about twins is… the money. This is the most boring and unmotherly response possible, but with a lot of help from family we’ve kind of managed the other stuff, whereas the finances is the bit we can’t quite yet square away. 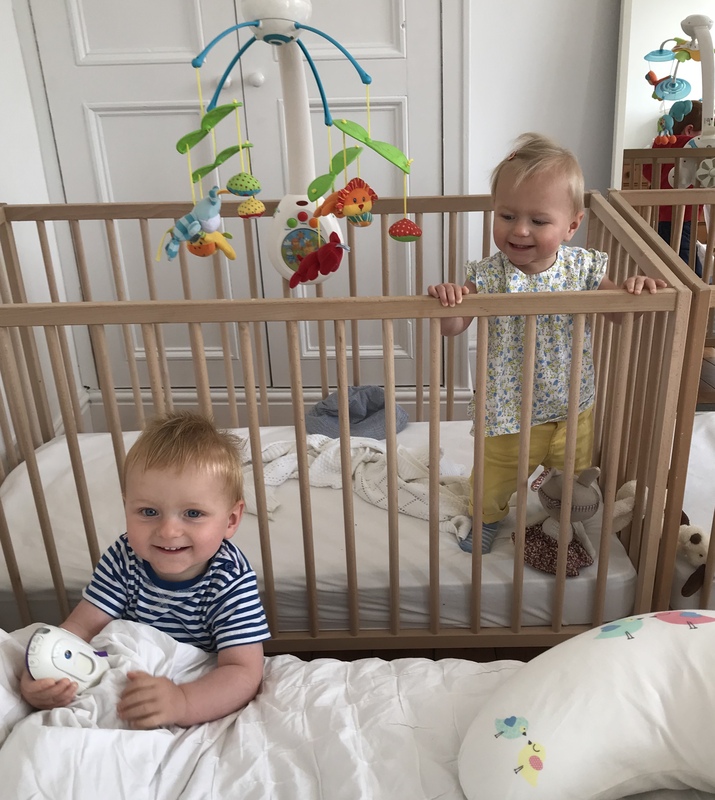 Double nursery fees is a killer (our bill is hovering around £1500 a month for three days a week, we started saving up to pay for it before the twins were even born), and our house isn’t big enough. None of it is the end of the world, but at some point we do have to work out where that extra bedroom is coming from. I wish I had known… That it would all be OK in the end. A year on and we’re mostly OK. Knackered, but OK! Being a twin mama is… next level mothering. I consider myself to be quite an organised person, but everything with twins requires such a huge level of planning that a large part of my brain is taken up with logistics at any one time. Feeding them, bathing them, getting them in and out of the car, giving them a bedtime story, giving them both proper cuddles; all things that just happened with Sam, but with two of them we have to actually think about it and decide how it’s going to work, and that’s mentally quite tough. There isn’t really any mental downtime with twins! My work is…..the thing that keeps me sane. I realised within the first few weeks of Sam arriving that being a stay at home mum was never going to be for me. I felt guilty about it initially, but I’m OK with it now and reason that we’re all different and you don’t have to want to be at home to love your children. I adore the 3 of them, but Monday-Friday 9-5 is my time to be myself, have intelligent conversations with other adults, and generally have my own space. It can be tough juggling everything, but it helps that I really love my job, and the idea of developing new treatments for women with breast cancer always keeps me inspired and engaged with coming to work. Twin magic looks like… when they make each other laugh. Or get cross at each other. Both are equally brilliant to watch. I wish… I was going to joke and say “that it had only been one baby”, but I actually don’t wish that at all. I think we’ve done pretty well over the last year so I wouldn’t wish anything to be different. Maybe I wish that childcare was a bit cheaper, so trying to be a family with three small children and two working parents wasn’t quite so tough. I am proud of… James and I for pulling together as a team and getting through it with our sanity (vaguely) intact. I’m particularly proud of James for not renegading on his promise to take on Shared Parental Leave when we found out we were having twins. He took months four to eight off work and, although he was a bit worried about it beforehand (as I skipped off back to the lab), he positively excelled at looking after the twins and keeping the house running. I ended up being quite gutted when he went back to work and I had to remember how to work the washing machine again. I have learnt… how lucky we are to have such an amazing support network. Both sets of parents were great when we just had Sam, but since the twins, they’ve consistently picked up the slack in ways we’d never even imagined, and we’d be lost without them. Whether it’s been cooking us meals for the freezer, buying clothes for the kids, or looking after three children for the whole summer so we could save on some nursery fees, they’ve been on hand every step of the way and we’ll never be able to thank them enough. I want my twins to know… that they weren’t part of the plan at all, but we couldn’t love them more if we tried.